Alison McGhee is the New York Times bestselling author of Someday, Little Boy, and Making a Friend. She lives in Minneapolis and Vermont. A bestselling author-illustrator duo join forces to create a modern father-son love story. 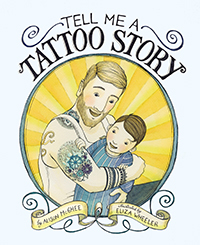 The father tells his little son the story behind each of his tattoos, and together they go on a beautiful journey through family history. There's a tattoo from a favorite book his mother used to read him, one from something his father used to tell him, and one from the longest trip he ever took. And there is a little heart with numbers inside—which might be the best tattoo of them all. Tender pictures by New York Times bestselling illustrator Eliza Wheeler complement this lovely ode to all that's indelible—ink and love.